The green tree python (Morelia viridis), is a species of python characterized by a relatively slim body. The head is large and clearly defined from the neck. The snout is large and angular. Young animals are bright yellow or red, but also brick-red or brown-red with broken stripes and spots. They change colours at 6 to 12 months. 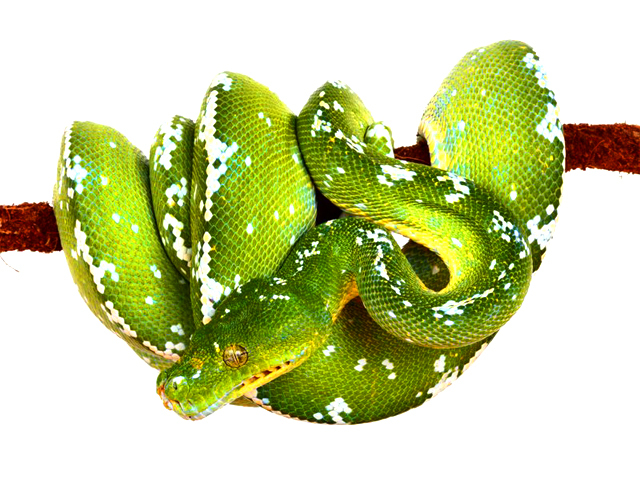 The color of adult green tree pythons can vary from different shades of green to yellow and blue with blue, yellow, white or black pattern. For an adult specimen a recommended cage size would be 1.0-1.2 L x 0.6 D x 0.6-0.8 H meters (3.2-4 x 2 x 2-2.6 feet) . Although Morelia viridis is an arboreal snake, the height is less important than the ground space. Also the temperature difference should not just be vertical but also horizontal. Morelia viridis usually stays on the highest branch, so it needs the possibility to move to a warmer or cooler place on this perch. The lower branches are mostly used for climbing in the active phase at night or to perch while hunting. On branch size the opinions differ, for us the rule of thumb is, that the diameter of the branch should not be thicker than the thickest part of the snake. Especially with young animals thinner perches should be used. For our adults and sub-adults we prefer natural branches because they vary in diameter and can offer the snake more options to fit its needs. For neonates we use plastic branches because they need to be cleaned and disinfected more often. Especially with neonates some people have had negative experience with large cages like refusing food. In our opinion it’s best to start with a small cage and change it according to the animals size. We keep our Neonates in boxes about 0.2 x 0.2-0.4 x 0.2 meters (0.65 x 0.65-1.3 x 0.65 feet). After 6 to 12 months, depending on the size of the juvenile, it should move into a larger cage about 0.4 x 0.4 x 0.4 meters (1.3 x 1.3 x 1.3 feet). For a sub-adult specimen a cage size of 0.6 L x 0.6 D x 0.6 H meters (2 x 2 x 2 feet) seems to be a good choice. The neonates of Morelia viridis are very small, like shoe laces, so you have to take care that those little ones don’t escape from their enclosures, a few millimeters are enough. Be aware that in all cases you have to check the legal requirements of your country. Usually there is no need for a hide box, because they perch in plain sight. To make them feel more safe we use natural plants as camouflage. Some animals prefer the hidden spots and some seem to not care at all. The only time a hide box is absolutely necessary is with a pregnant female. They use those boxes for the egg deposition and if there is nothing available it can lead to her being egg bound. We prefer turf, because of its characteristics being acid it doesn’t mold and it’s harder for bacteria to grow on it. It can store humidity, can be cleaned easily and you can do a bio-active setup. Also we had never any trouble when an animal accidentally swallowed some of it while feeding. If you go for an coarse substrate you have to take care that the snake doesn’t swallow large parts, because this can cause an intestinal obstruction. For lightning you can use nearly everything you want, but if it’s a lamp which gets hot (e.g. common light bulb) it’s absolutely necessary that it is outside of the cage or in a special secure cage. Otherwise Pythons will climb on it and burn themselves which will lead in best case to scares in worst case to a dead animal. Morelia viridis natural habitat is next to the equator, therefore a light circle of 12 hours day and 12 hours night the whole year round works perfectly. One way to get the required temperature is using the waste heat of the lightning. We prefer heat panels on the ceiling for our sub-adult and adult cages and heat mats on the back of our neonate cages. The big advantage is, that you can heat independently from the light, which makes it possible to warm up the cage at night. Also you can regulate the temperature more delicate because you can dimm them without any visual disturbance. Like mentioned above it is very important that there are different temperatures on each horizontal layer (=branch) because they ’ll usually stay on the highest one the whole day long. During the day the temperature gradient should be between 25-31°C (77-88°F), at night about 24°C (75°F). There are populations of Morelia viridis which live in the highland where night temperatures drop to 18°C (65°F), so in theory this should be manageable for those animals. Because of the different conditions in a cage we prefer to stick to 24°C (75°F) to be safe. Fresh water should always be available. Some keepers prefer to fix it on a higher level, we simply put it on the ground. Some animals also drink spray water from the cage walls, leaves or themselves. Although Morelia viridis comes from the tropical rain-forest, there is no need to have a humidity of 90-100% permanently. In our opinion depending on cage size, ventilation, substrate and plants misting is necessary from two times a day to two times a week. The average humidity level should not fall under 60% with regular misting there should be highs and lows in humidity. However the surface should dry off daily. Natural plants can be helpful to keep the humidity more constantly. A good sign for the suitable humidity is if the animal sheds perfectly with the skin being in one part. Neonates of Morelia viridis are often trouble makers when it comes to feeding. In nature they seem to feed on little lizards and some of them seem to not see mice as prey items in the beginning. A reliable breeder will not give away his juveniles before he is sure that the animals will eat, therefore it is important to take a close look on whom you are buying from so you don’t end up with an animal which refuses food. It’s not unusual that single animals from a clutch might never start to eat but after this first period of life, Morelia viridis is a quite problem free eater. Neonates should be fed about every 4 to 7 days, starting with freshly born mice. Sub-adults and adults once every 2 – 3 weeks, depending on size of the prey items. Big females can be fed with larger prey items every once in a while, but then we recommend a feeding pause of about 4 to 5 weeks. We try to handle our animals as little as possible. We use special mounts for our branches, so we can take each out individually without having to remove the snake from her coiled branch. This procedure is quite stress-less for the animals and in most cases enough, like changing something in the cage or taking a closer look at the animal if the shed went well. Like all animals they have different characters, but in our opinion they are far away from aggressive, like they still are often described. With the turf cleaning is quite easy, we just use a paper towel and remove the dirt and the surrounding turf. We also have a bio-active cleaning crew, which supports us. Because of our mounted branches, the bottom of the cages are, except for the plants, free to clean. We disinfect the water bowls every week and the feeding instrument after every feeding. If humidity is suitable, the shed should come of in one piece, in our opinion there is no need for a wet box or anything like that. Rough branches can also be helpful. Health problems, apart from inborn defects, can usually be avoided with ensuring that all environmental conditions are suitable. Most respiratory infections come from to low temperatures, air draft or wrong humidity. Stomatitis (mouth rot) is usually just a side effect of a different medical problem. When getting a new animal a strict quarantine is absolutely necessary. We use glass cages because they can be disinfected with intense products without any harm to the material. As substrate we prefer newspaper or paper towels because it’s easier to clean and you get uncontaminated feces for probes. A common problem with Morelia viridis is a kink in the tail. There are various reasons for this deformation, e.g hard feces, to large branches where they can’t hold on well enough when striking or wrong handling. To ensure you don’t damage the animal you should always unwind the tail calm and slowly from the branch when removing the animal from its cage. If the kink is past the cloaca it’s usually just an optical failure, if it’s in front it can cause problems with defecation and egg deposition.